From the pulpit of Tabernacle Baptist Church on Sunday, Rev. 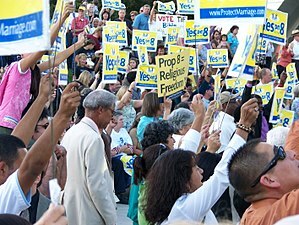 Al Sharpton called out the Mormon Church and other conservative faiths for mobilizing to support Proposition 8 to ban gay marriage in California while refusing to be as involved in any other social concerns. “It amazes me when I looked at California and saw churches that had nothing to say about police brutality, nothing to say when a young black boy was shot while he was wearing police handcuffs, nothing to say when they overturned affirmative action, nothing to say when people were being delegated into poverty, yet they were organizing and mobilizing to stop consenting adults from choosing their life partners,” Sharpton told a packed audience on Jan. 11.